You are here: Home / Damp / Condensation / Ratio of Rising damp to condensation in rented and private housing. Ratio of Rising damp to condensation in rented and private housing. This 'dry' wall has copius mould growth. A sure sign of a condensation problem. Damp is a complex area and houses vary – so why are some dwellings more prone to damp of one type or another? To complicate the issue, it’s not just about housing design and construction, but also the way a house is lived in – yes, sometimes it’s down to the tenant or occupier, other times the house, and often a bit of both. Take the ratio of damp between private – middle class type dwellings and council or other rented accommodation. You’d think there would be little difference? In fact, they’re poles apart. I’ve taken a small random sample of privately owned houses, which I’ve surveyed for damp problems. Of the ten houses – four had no damp problems at all. The other six had various defects including three cases of rising damp, four with condensation issues and two with penetrating damp problems (that’s more than ten, but hey, you can have more than one damp problem at a time). Ten rented dwellings were surveyed – seven council owned houses and three private rented houses, over the same period. Nine of these had a damp problem of some kind, which had impacted on the tenant’s enjoyment of their home (hence my involvement). None had rising damp. One had penetrating damp. eight had a condensation problem and two had bridged cavities and bridged damp-proof courses. The two quickly visible differences are the rate of rising damp in the private housing and the lack of it in the council houses. Also the high rate of condensation in the tenanted sample. I can’t tell you for sure…but I can explain some of the reasons. First lets take the construction methods. Private property – The construction was very variable here – ranging from solid brick (no cavity), cavity brick, stone with rubble filled cavities, stone/brick in combination, rendered and naked brick. Some with a physical DPC, some with no DPC and some with a chemical DPC AND a physical DPC. terraced housing, semi detached and detached. Some solid floors, most were suspended timber. Most have part or full double glazing. All have central heating – mainly pre-war construction. Rented property – mainly post war construction – all with a physical DPC, two with a Chemical DPC too. All cavity construction, most were insulated. All were fully double glazed. Most have solid floors. None were rendered. A few had gas central heating, most had electric storage heaters. The private houses were almost all underused, (though three were unoccupied, so it was hard to tell), with at least one or more spare bedrooms or rooms used as studies, music rooms and such. None of the ten appeared full. The adults present were there to meet me and appeared to be usually out at work. The rented property varied between the private and council side, with council houses having a higher occupancy level (in one case four people in a two bed apartment). The private rented was more akin to private home owned, perhaps slightly higher levels. Some of the adults present appeared not to work. Now then, the above is by no means a scientific analysis, but my anecdotal evidence raises some conclusions worth bearing in mind. Rising damp is more likely in older, none standard construction and in houses without an existing DPC – that’s a no brainer. 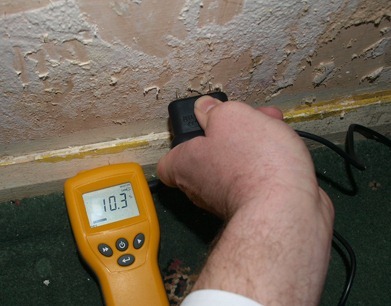 Rising damp is rarely present in post war housing with an existing DPC. Unless it is the result of a bridging problem. Condensation can be in any house but will be more common in post war renovated council housing than in privately owned homes. The reasons are complex but clearly, higher occupancy levels are a factor, greater usage (moisture production all day for the unemployed – retired or infirm). Surprisingly I did not find that ventilation was more restricted in the council housing – private homeowners seem more likly to have no extraction in their bathrooms or kitchens than their rental counterparts (though maintenance of existing fans was a feature of the council dwellings, with three of them having fans disabled at the isolator switch – presumably for reasons of economy or noise abatement). The council tenants have a greater need for the ventilation, due to the higher occupancy. One other factor was heating, which in private housing was with central radiators, giving gentle warmth throughout a house. Whilst often, in the rented sector, temperature peaks and troughs are found, due to the electric heating and the fact that any unused space is normally unheated for economy’s sake, and becomes a cold condensation trap, as vapour pressure fills it each night. There’s lots to think about here….